For more information on any of our retreat activities, visit our Calendar, or email our office at info@gsl-ab.ca. We usually have an intermediate retreat each year lasting several days. Retreats completed include Chenresig Guru Yoga (2013), Green Tara (2014), Chenresig Guru Yoga focusing on His Holiness’ Name Mantra (2015), and Lam Rim Retreat (2017 and 2018). Retreats for Kalachakra initiates are held periodically. Calm Abiding is a mindfulness meditation practice that teaches you how to focus your mind single-pointedly on a simple object and helps bring your mind to a state of peacefulness, tranquility, and stability. This retreat is suitable for beginners as well as regular practitioners and is typically held at the Providence Renewal Centre in Edmonton. 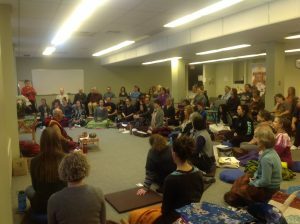 New in 2018 was a 3-day Path of Meditation Retreat also held at the Providence Renewal Centre. Kushok Lobsang Dhamchöe, our Spiritual Director, offers a full-day commentary on Shantideva's text The Way of the Bodhisattva. The teachings offered at this retreat are a result of Kushok’s extensive study and contemplation of the teachings he received on this text throughout his life from His Holiness the Dalai Lama. Kushok’s teachings are filled with humour and entertaining stories and are suitable for both new and long-term attendees.